Chip Somodevilla/Getty ImagesMAY 08: Former Director of National Intelligence James Clapper (L) and former acting U.S. Attorney General Sally Yates are sworn in before testifying to the Senate Judiciary Committee’s Subcommittee on Crime and Terrorism in the Hart Senate Office Building on Capitol Hill May 8, 2017 in Washington, DC. The Trump administration made the unprecedented move of revoking former CIA Director John Brennan’s security clearance on Wednesday. The White House has also threatened to revoke the clearances of nine other former intelligence officials – all of whom have publicly criticised President Donald Trump. Here’s a look at who they are and what they have said to criticise Trump. Trump’s move earned some sharp reactions in Congress and within the national-security community, with some saying they perceived it as an abuse of presidential power. 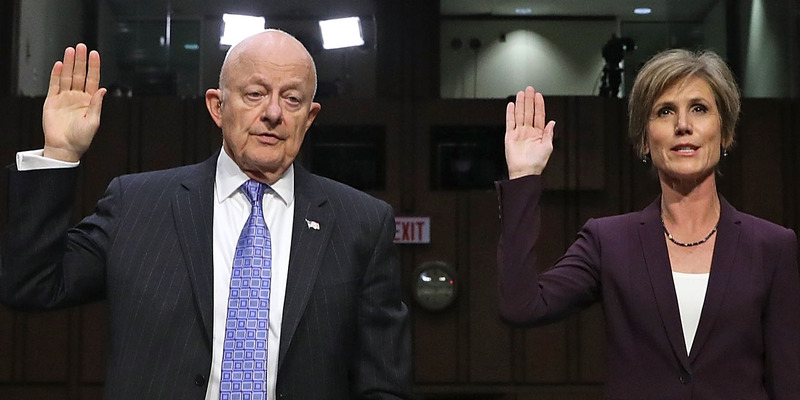 As national security experts have explained, it’s standard protocol for former high-level intelligence officials to keep their security clearances after their government service has ended, so they can be a resource to future administrations on matters of national security. Despite the outrage over Trump’s action on Brennan this week, the president might not stop there. The White House has publicly named nine other former national security and intelligence officials who have publicly criticised the Trump administration. Gen. Clapper is a retired lieutenant general in the US Air Force and longtime veteran of the US intelligence community. 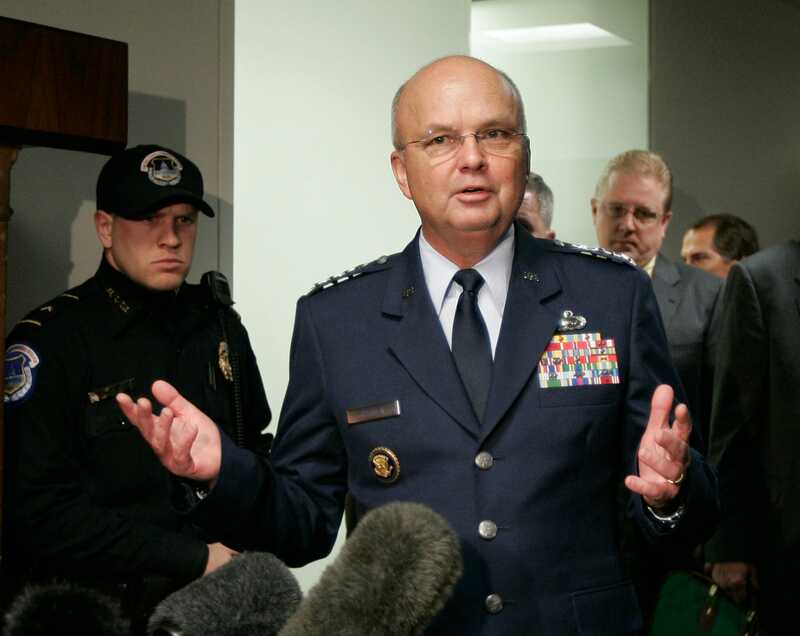 He served as Director of National Intelligence under President Barack Obama from 2010 to 2016. “I will continue to speak out, regardless of whether I have a security clearance,” Clapper told CNN’s Jake Tapper on Wednesday. “If they are saying that the only way I can speak is to be in an adulation mode of this president, I’m sorry but I do not think I can sign on for that,” Clapper said. Gen. Michael Hayden, a retired four-star general in the US Air Force, served as the Director of the National Security Agency under Presidents Bill Clinton and George H.W. Bush and the Director of the CIA from 2006 to 2009. Hayden has been particularly critical of Trump’s approach to foreign policy and national security, and has thrown some jabs at the Trump family. “Surprising views from such an accomplished scholar,” he wrote sarcastically in a tweet mocking Donald Trump Jr., who attempted to compare the Democratic Party to Nazis. In one post, Hayden used 87 laughing emojis in response to Trump’s attempt to walk back comments he made during his summit with Russian President Vladimir Putin, in Helsinki, Finland. At a news conference following that July 16 summit, Trump indicated that he believed Putin over the American intelligence community on the matter of Russia’s interference in the 2016 US election. Trump’s attempt to reframe his remarks a day later was widely mocked. Comey hasn’t had an active security clearance since his firing in May 2017, per department protocol, but that did not stop the White House from adding Comey to the list of individuals whose security clearances it said were being reviewed. The former FBI director hasn’t held back from criticising President Donald Trump on Twitter. McCabe served as Deputy Director of the FBI from February 2016 to January 2018. Attorney General Jeff Sessions fired him in March, just days before he was scheduled to retire and receive his pension. Trump has frequently accused McCabe of being politically bias against him amid his involvement in the investigation of Hillary Clinton use of a private email server. He has frequently railed against Andrew’s wife, Jill, also. “Andrew McCabe FIRED, a great day for the hard working men and women of the FBI – A great day for Democracy,” Trump tweeted after McCabe’s termination was announced. McCabe responded with a public statement in which he described Trump’s attacks as “one part of a larger effort not just to slander me personally, but to taint the FBI, law enforcement, and intelligence professionals more generally. “It is part of this Administration’s ongoing war on the FBI and the efforts of the Special Counsel investigation, which continue to this day,” McCabe said. Like Comey, McCabe no longer has an active clearance. Sally Yates, a former Deputy Attorney General and a US attorney first appointed under President Barack Obama, was fired in the early days of the Trump administration for refusing to enforce or defend the executive order which temporarily restricted refugees and travellers from certain majority-Muslim nations. Her decision was based on concerns over the constitutionality of the order, yet she was terminated for insubordination. In the following months, parts of the order were struck down by federal judges, while others were upheld. Yates, along with Gen. Clapper, has also testified before Congress on the subject of Russian interference in the 2016 US election. She hasn’t been as vocal as some of the others on this list, but many of her public statements about the Trump administration are highly critical. “Our President today not only chose a tyrant over his own Intel community, he chose Russia’s interests over the country he is sworn to protect,” she wrote after Trump’s July 16 summit with Russian President Vladimir Putin. Susan Rice served as National Security Adviser and US ambassador to the UN in the Obama administration, and worked as a staff member on the National Security Council under Bill Clinton. Rice routinely criticises the Trump administration and the Republican Party, including in her capacity as a contributing opinion writer at The New York Times. In a August 10th op-ed titled “President Trump, the Autocrats’ Best Friend” she criticised the State Department for “false equivalency, refusal to criticise obvious human rights abuses, and abdication of American moral leadership” in their handling of the dispute between Saudi Arabia and Canada. Peter Strzok, a 22-year veteran of the FBI, has been embroiled in a scandal for the past year over anti-Trump text messages he exchanged with FBI attorney Lisa Page while he served the probe of Clinton’s use of a private email server. In the text messages, Strzok and Page, who were having an extramarital affair at the time, expressed disdain for Trump, but later said their opinions did not influence their work. While Strzok was initially demoted and suspended, FBI deputy director David Bowdich abruptly terminated him on August 13. Page voluntarily left the Bureau in May. Trump routinely decries Strzok and Page, who he terms “the FBI lovers,” to discredit the Mueller probe and the FBI more generally. Both have testified in congressional hearings on Capitol Hill about their conduct. Attorney General Jeff Sessions indicated in June that Strzok had lost his security clearance as part of the internal review into his conduct. Page sat for a private interview before lawmakers on Capitol Hill in July, after which Republican lawmakers praised her testimony and the information she provided. It is not clear whether Page has an active security clearance, since she left voluntarily and was not terminated like Comey, McCabe, and Strzok. Bruce Ohr, an official at the Department of Justice, is also on the White House’s list of individuals whose security clearances are under review. In recent days, Trump has zeroed in on Ohr, accusing him of taking part in the development of the Steele dossier – the compilation of memos gathered by the former British intelligence agent Christopher Steele. Ohr’s wife, Nellie, worked as a consultant for Fusion GPS, the firm that was commissioned to produce the dossier. Trump expressed his angst about this in an August 14 posting.